For other uses, see Sauber (disambiguation). Sauber Motorsport AG is a Swiss motorsport engineering company. It was founded in the 1970's (as PP Sauber AG) by Peter Sauber, who progressed through hillclimbing and the World Sportscar Championship to reach Formula One in 1993. In 2019, following a sponsorship deal, Sauber Motorsport AG renamed their Formula One racing team to Alfa Romeo Racing after operating it under their own name from 1993 until 2018. 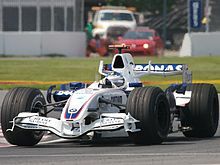 Having not won a Grand Prix as an independent, the team was sold to BMW in 2005, and competed as BMW Sauber from 2006 to 2009, scoring one victory. At the end of the 2009 season BMW pulled out of Formula One and the team's future remained uncertain for several months, until it was sold back to Peter Sauber and granted a 2010 entry. Due to issues with the Concorde Agreement, the team remained as "BMW Sauber" for the 2010 season. In March 2010, Peter Sauber announced plans to change the team name during the season, but the FIA announced that they would have to wait until the end of the season to change their name. At the beginning of the 2011 season the team dropped BMW from their name. Until mid-2016 Peter Sauber held a controlling 66.6% stake in the team, with the remainder belonging to then CEO Monisha Kaltenborn; she had been a leading figure in the team since BMW's withdrawal. The team was sold during the 2016 season to Swiss investment firm Longbow Finance S.A, with Pascal Picci taking over Peter Sauber's role as chairman of the board and president. Peter Sauber began building sports cars in the 1970s. After using turbocharged Mercedes V8 engines in the 1980s, his team became the official factory team of Mercedes-Benz, reviving the Silver Arrow legend. They won the 24 hours of Le Mans and the World Sports Prototype Championship (1989 and 1990), competing against Jaguar and Porsche. Among others, drivers such as Heinz-Harald Frentzen, Michael Schumacher, Karl Wendlinger, Jochen Mass, Jean-Louis Schlesser and Mauro Baldi raced for Sauber. Sauber participated in a number of other racing series before its involvement in Formula One, including the Swiss Sportscar Championship and the World Sportscar Championship. The first Sauber car, C1, was built in 1970. Sauber, in partnership with Mercedes, won the Le Mans 24-hour race in 1989 and the World Sports Prototype Championship in 1989 and 1990 with the Sauber C9 and Mercedes-Benz C11 respectively. The first 'turbo era' of Formula One ended with the 1988 season. The 1.5-litre turbocharged engines were phased out in favour of naturally aspirated 3.5-litre engines. A massive demand for engine suppliers and a constant influx of new teams saw car manufacturers like Subaru, Porsche and Lamborghini enter Formula One as engine suppliers and sometimes buying out existing teams. Other projects never progressed beyond design studies, such as one carried out by Simtek for BMW. It was a turbulent time that led to the withdrawal of many small teams and even more famous marques such as Brabham and Lotus. A planned Mercedes collaboration with Sauber to enter their own Formula One team was shelved, although behind closed doors Mercedes continued to fund Sauber's Formula One project. The team was to be powered by V10 Ilmor engines in a chassis dubbed the C12, a continuation of Sauber's naming policy from sports car construction (the 'C' was a reference to Peter Sauber's wife Christine). It was to be driven by JJ Lehto and Karl Wendlinger. The traditional Sauber "S" logo which has evolved through different sponsors over the years. The car's racing debut took place in the first race of 1993, in South Africa. The car was soon turning heads not only for its sharp FW14-like lines and striking black livery but its impressive performance, claiming fifth place (two points under the scoring system at the time) on its Grand Prix debut. Despite this impressive entrance to the Grand Prix scene, over the remainder of the season the team rarely saw the finish line due to unreliability and racing accidents. However, they proved their form was not a flash in the pan recording a slow stream of points finishes and rarely finishing outside the top ten when they actually completed a race distance. Despite not achieving a podium, they ended the season with twelve points, seventh out of the thirteen original entries. The team went into the 1994 season as Sauber Mercedes, now officially Mercedes's factory-backed team with a new car in the Sauber C13 and the Ilmor engine rebadged the Mercedes 3.5 V10. New team Pacific Grand Prix Ltd took a customer supply of more dated Ilmor units. Between seasons Lehto had signed to Mild Seven Benetton Ford. Former Sauber sports car driver Heinz-Harald Frentzen took up the role as Karl Wendlinger's teammate. Early signs showed the team were, rather disappointingly, delivering similar performances to the previous year, scoring a small tally of points in the opening rounds. The season took a turn for the worse after a 4th place by Wendlinger following the tragic deaths of Ayrton Senna and Roland Ratzenberger at the San Marino Grand Prix. Just two weeks later, Wendlinger was seriously injured after crashing in practice for the Monaco Grand Prix; losing control of his car under braking for the Nouvelle Chicane. He suffered serious head injuries, which left him in a coma for weeks, and he was sidelined for the rest of the season. He was replaced by Andrea de Cesaris and a returning Lehto who had been replaced at Benetton after injury complications. The Wendlinger accident was a pivotal moment in Formula One history. Together with the death of Ayrton Senna, it later prompted the mandatory implementation of head protection for drivers in the form of high cockpit sides. Sauber voluntarily pioneered prototypes of these to protect their drivers. They would finish the season with the same points tally as the previous year but finished only eighth out of the fourteen original entrants. Mercedes was dissatisfied with the progress and left the team at the end of the year, enticed by an offer from the McLaren team which was still looking for a new works deal since Honda withdrew from the sport. The partnership would see Team McLaren Mercedes take their first win in 1997 and both titles in 1998, but left Sauber to pick up the works Ford engine deal from Benetton. The 1995 season and Sauber C14 marked the beginning of a ten-year sponsorship deal with energy drink giant Red Bull. Entrepreneur Dietrich Mateschitz had purchased a majority share in the team and Fritz Kaiser joined as commercial director. They landed a factory supply of Ford ECA Zetec-R V8 engines. The 1995 season saw the return of Karl Wendlinger partnering Heinz-Harald Frentzen. Unfortunately, the Austrian's serious accident in 1994 seemed to have taken a lot out of his driving potential and he was replaced after two races by rookie Jean-Christophe Boullion. The season, for Frentzen at least, went surprisingly well. The team finished with a record eighteen points despite the underperforming Ford engine and Jean-Christophe Bouillon, who was again dropped, allowing Wendlinger to make his final Formula One appearance. They also climbed back up to 7th in the Constructors' Championship. 1995 also saw Petronas become Sauber's presenting sponsor. They renewed their association in 2007, by which time the team had changed ownership. 1996 saw Sauber's worst Formula One season in terms of points despite a promising driver line-up in Heinz-Harald Frentzen and Johnny Herbert, a revised C15 and the new V10 Cosworth JD engine. Despite again holding seventh spot on a shrinking list of constructors, they only scored 11 points and had not impressed for much of the season. For the next season they announced a customer deal to receive Ferrari V10 engines while they worked with new sponsors Petronas to construct their own engines. Unfortunately, due to a major economic crash in Asia the engines were never completed. Giancarlo Fisichella driving for the Sauber team at the 2004 US Grand Prix at Indianapolis. Jacques Villeneuve driving for the Sauber team at the 2005 Canadian Grand Prix. Sauber used Ferrari designed engines (from 1997 to 2005) and gearboxes built by Sauber Petronas Engineering, a company founded for the sole purpose of building these engines, that were nearly identical to the ones used by Ferrari. Sauber licensed nearly every legally licensable part from Ferrari and even had several Ferrari engineers on staff. Many pointed out suspicious similarities between Ferrari and Sauber chassis, but no formal accusations were ever made (FIA rules required each team to design their own chassis). In 2001, Sauber brought a virtually unknown and very inexperienced Kimi Räikkönen into Formula One, despite the protests of a few drivers and influential members of the FIA, including Max Mosley, that he would pose a danger to other drivers. His performances that year, however, more than vindicated their decision (he would later go on to win the 2007 Drivers' Championship with Ferrari). It also caused Red Bull to sell their majority share in the team to Credit Suisse in protest (Red Bull wanted Enrique Bernoldi to take the seat but he wound up at Arrows). In 2004, Sauber spent a large sum of money on a new wind tunnel at Hinwil, and a high performance supercomputer (called Albert) to help refine the aerodynamics of their cars. The state-of-the-art infrastructure Sauber has built up is one aspect that attracted BMW Motorsport to Sauber. In its later years, Sauber's links with Ferrari became weaker. They sided with the non-Ferrari teams over planned rule changes at the end of the 2004 season and also joined up with the GPWC. Then they decided to switch to Michelin tyres, while Ferrari continued to use Bridgestone tyres. Meanwhile, beverage company Red Bull left Sauber in 2005 as they founded their own team, Red Bull Racing. BMW ownership commenced from 1 January 2006 with BMW having bought Credit Suisse's share in the team. Sauber's final Grand Prix before BMW takeover was the 2005 Chinese Grand Prix, with Massa scoring a welcome sixth place to round off the team's history. Sauber had finished its independent run in F1 with six third places and two front-row starts being their best results. Amongst notable Sauber drivers were Jean Alesi, 2008 Drivers' Championship runner-up Felipe Massa, Johnny Herbert, and 1997 World Champion Jacques Villeneuve. Two former Sauber drivers drove for the new BMW Sauber team in 2006: Nick Heidfeld who was a Sauber driver from 2001 to 2003, and Villeneuve who drove for the team in 2005. Nick Heidfeld took BMW's first podium finish at the 2006 Hungarian Grand Prix. BMW Sauber put "Thanks Michael" messages on the back of their cars for what was then Michael Schumacher's last Grand Prix in Brazil. 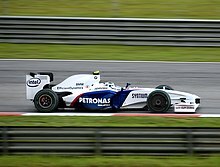 At the end of the 2005 season, the team's majority shareholding previously owned by Credit Suisse was bought by BMW, with Peter Sauber retaining a 20% stake, and was renamed BMW Sauber. BMW sold its part back to Peter Sauber after the end of the 2009 season, but the team formally used the name 'BMW Sauber' until the end of the 2010 season. For the 2006 season the team re-signed Nick Heidfeld from Williams to be their lead driver (Heidfeld drove for Sauber in 2001-2003), while 1997 World Champion Jacques Villeneuve had his existing Sauber contract confirmed. Pole Robert Kubica was signed as the team's third driver. The team continued to use Sauber's facilities, mostly for chassis construction and wind tunnel testing, while BMW's headquarters in Munich were responsible for building the new P86 V8 engine. Former Sauber title sponsor Petronas renewed their contract with the new team after BMW Sauber snubbed BP-Castrol, despite them being BMW's official commercial gasoline and motor oil partner. Credit Suisse also continued their sponsorship. For the new season BMW Sauber announced a technical partnership with Intel and O2, claiming that it will eventually lead to technological improvements available on BMW road cars. The new livery, unveiled in Valencia on 17 January 2006, was the traditional BMW M blue and white with red flashes. Jacques Villeneuve scored the team's first points with a seventh-place finish at the 2006 Malaysian Grand Prix, after Heidfeld retired from fifth with an engine failure late in the race. Over the first two-thirds of the season the drivers picked up points with a succession of seventh- and eighth-place finishes. The team ran a radical "twin towers" aero enhancement on the front of the car for the race in Magny-Cours, France, which was meant to direct airflow to the rear and thus improve performance. This unconventional add-on was promptly banned by the FIA as it was adjudged to impede the drivers' vision and thus compromise safety. Heidfeld scored the team's first podium at the 2006 Hungarian Grand Prix from 10th on the grid. Kubica stood in for Villeneuve, BMW stating that Villeneuve could not drive due to medical complications following his accident at the German Grand Prix. Kubica finished seventh, although he was later disqualified for an underweight car. After the Hungarian Grand Prix, BMW announced that Kubica would complete the season for the Swiss team, spelling the end of former world champion Villeneuve's F1 career. Kubica scored BMW Sauber's second podium of the season at the Italian Grand Prix, after running in third place for most of the race and leading briefly during the first round of pit stops. Heidfeld struggled in the race and barely earned a point by finishing eighth. The team's fifth place in the Constructors' Championship was cemented by Heidfeld's two further points at the 2006 Chinese Grand Prix, and Toyota's early double retirement from the 2006 Brazilian Grand Prix. Nick Heidfeld took BMW Sauber's best result of 2007 with second place at the Canadian Grand Prix. On 19 October 2006, it was announced that Robert Kubica would partner Nick Heidfeld for the 2007 season with Sebastian Vettel taking the test and reserve driver role. On 21 December, it was announced that Timo Glock had been signed as the team's second test driver. The team launched their 2007 car, the F1.07, on 16 January 2007. The new car showed promising form throughout the winter testing, topping the times sheets on occasions. However, team principal Mario Theissen declared some reliability concerns before the season's opening race in Melbourne. Robert Kubica duly retired from 4th place mid-race with gearbox trouble, but Nick Heidfeld proved their pace in winter testing was no fluke as he raced to 4th place. Heidfeld has continued this success with two more 4th places in Malaysia and Bahrain respectively. Kubica finished 6th in Bahrain after retiring in Australia and mechanical trouble in Malaysia. Their performance thus far had been such that many were saying a race win was likely after firmly establishing themselves as the best team behind championship leaders Ferrari and McLaren. Although the perceived performance gap between the two leaders and BMW Sauber was a fair amount, it was still less than that between BMW Sauber and the teams behind them. The Canadian Grand Prix brought mixed fortunes for the team. While Nick Heidfeld scored a 2nd-place finish, Robert Kubica suffered a huge crash that resulted in a long safety car period. The media was initially told Kubica had broken his leg, but it later proved that he had escaped with only a sprained ankle and concussion. Sebastian Vettel took his place in the US Grand Prix, finishing in 8th place and therefore becoming the youngest driver to score a Formula One World Championship point. After the European GP, however, it was announced by Scuderia Toro Rosso that Vettel would take the second driver seat from Scott Speed. BMW Sauber took a podium finish in the first race of the 2008 season, courtesy of Nick Heidfeld. The Canadian Grand Prix saw Robert Kubica win his and BMW Sauber's only race. On 21 August 2007, BMW confirmed its driver line-up of Heidfeld and Kubica for the 2008 season. Their 2008 car, the F1.08 was officially launched in Munich at BMW Welt on 14 January 2008. It made its track debut at Valencia the next day, with Robert Kubica driving. The BMW Sauber team also introduced a new scheme for the team as a whole, with every individual getting "fit for pole", from the boss to the cleaners, meaning that the team would be in optimum fitness for the 2008 season. Team principal, Mario Theissen boldly targeted the young team's first Formula 1 victory for 2008, a bench-mark many outside the organisation felt was overly ambitious. BMW Sauber's first race victory came in the 2008 Canadian Grand Prix, the team achieving a one-two finish with Robert Kubica's first race win and Nick Heidfeld taking second place. The victory came after Lewis Hamilton collided with Kimi Räikkönen in the pitlane, ending the race for both drivers. Kubica was on a different refuelling strategy from Heidfeld, who also briefly led the race before securing the one-two finish for BMW Sauber in comfortable fashion. This was the first Formula One victory for a BMW engine since the 2004 Brazilian Grand Prix. After the team's breakthrough win, development was switched to the 2009 season where new regulations come into play. This greatly annoyed Kubica, (who was leading the championship after the Canadian Grand Prix), as he felt they could have had a realistic chance of taking at least one title. The lack of development was reflected with a drop of form throughout the second half of the season, causing BMW to be outpaced by Renault, Toyota and even Toro Rosso (who started the season as one of the slowest teams) by the end of the season. Despite this, Kubica remained with an outside chance of taking the Drivers' Championship until the Chinese Grand Prix, the 17th round out of 18. In a disappointing final year for BMW, Nick Heidfeld took the first of the team's two podiums during the season at the 2009 Malaysian Grand Prix. In October 2008, the team confirmed that they would stick with Robert Kubica and Nick Heidfeld as their drivers for the 2009 season. Although BMW Sauber targeted the 2009 season as the year they would challenge for the title, their start to the season has been a disappointment. Kubica was in 3rd place in the opening round, when he collided with Vettel while battling for 2nd place and was forced to retire. Heidfeld then secured the team's first podium of the year in Malaysia, but after 6 races BMW Sauber had collected a mere 6 points, and occupied 8th place in the Constructors' Championship out of 10 teams. A raft of upgrades were set for Turkey, including an improved regenerative braking system (KERS) and a double deck diffuser. While the new diffuser was implemented, the KERS could not be made to fit the new car and both drivers raced without the device. After the qualifying session for the British Grand Prix Mario Theissen announced that the team had decided to halt further development KERS; of which BMW had been one of the strongest proponents, and focus instead on improving the car's aerodynamics. This left Ferrari and McLaren as the only remaining users of the KERS system. In the European Grand Prix at Valencia Robert Kubica scored the team's first points since the race in Turkey. Following a meeting of the BMW board on 28 July, the company held at press conference the following morning in which it confirmed the team's withdrawal from Formula One at the end of 2009. Chairman Dr Norbert Reithofer described the decision as a strategic one. The Formula One Teams Association released a statement in response pledging its support to help the team remain in F1. On 15 September 2009, it was announced that BMW Sauber had secured a buyer, Qadbak Investments Limited which turned to be a shell company. However, Lotus Racing had been given the 13th and final slot in the 2010 season. The team were awarded what was termed a 14th entry, which hinged either on another team dropping out or all the other teams agreeing to allow 28 cars to enter the 2010 Championship. On 27 November 2009, it was announced that Peter Sauber would repurchase the team conditional upon the team receiving a FIA entry for the 2010 season. On 3 December 2009, the FIA confirmed that Sauber had been granted the entry vacated by Toyota Racing following their withdrawal and would be using Ferrari engines. Peter Sauber had previously announced, on 29 November, that the team's chassis for the 2010 season would be designated Sauber C29, while the Swiss newspaper Blick reported that the team will be called Team Sauber F1. However, in January 2010, Peter Sauber had said that he had not yet applied for a change of name, so therefore they remained for the season as BMW Sauber F1 Team despite zero BMW components. Kamui Kobayashi was announced as their first signed driver for the 2010 season on 17 December 2009. Pedro de la Rosa was signed as Sauber's second driver on 19 January 2010. Before the Singapore Grand Prix, it was announced that Nick Heidfeld would replace de la Rosa for the remaining 5 races of the season. Esteban Gutiérrez later joined the team as a reserve driver, and drove during young drivers' testing after the end of the season. Despite promising pace in winter testing, the team struggled with technical problems in the early rounds of the season, with no points from the first six races. After running a blank livery for the first four races of the 2010 season, the team finally announced a sponsorship deal with the Burger King fast food franchise at the Spanish and European Grands Prix. During frustrations, Peter Sauber admitted that his decision to rescue the team had been emotionally driven, but insisted that it was proper. Finally, in Turkey, Kobayashi finished 10th, collecting the team's first championship point for the season. At the European Grand Prix in Valencia, after qualifying in 18th place, Kobayashi drew attention while driving a vast proportion of the race in 3rd position defending from Jenson Button who was following closely behind in 4th. After entering the pits during the closing stages of the race to switch tyres, Kobayashi exited the pit in 9th. In the last few laps of the race, Kobayashi overtook the Ferrari of Fernando Alonso and the Toro Rosso of Sébastien Buemi for a 7th-place finish. The impressive drive from Kobayashi received much acclaim and was Sauber's best result of the season to-date. Pedro de la Rosa meanwhile, despite originally crossing the line in 10th position to secure 1 point, would eventually only finish in 12th place after a penalty, stripping away a double points finish. This accomplishment, however, was later achieved at the Japanese Grand Prix and Korean Grand Prix. The second half of the season gave more productive and consistent results; The drives of Kobayashi, Heidfeld and de la Rosa combined earned 44 points, giving the team 8th place in the Constructors' Championship. Kobayashi performed the team's season-best finish of 6th at the British Grand Prix. Kobayashi was retained for 2011; he was joined by teammate Sergio Pérez and his compatriot Esteban Gutiérrez as reserve driver. The team debuted their 2011 car – the C30 – on 31 January, with testing beginning the following day. At the start of the season in Australia, both Pérez and Kobayashi were later disqualified due to technical infringements. Pérez suffered a major collision at the Monaco Grand Prix, resulting in concussion and a sprained thigh. Despite being passed fit for the Canadian Grand Prix, Pérez withdrew from the weekend after the first free practice session due to illness, he was replaced by 2010 Sauber driver Pedro de la Rosa for the remainder of the weekend. For the remainder of the season, the team obtained regular top-10 finishes, and overall finished 7th in the Constructors' Championship. On 28 July, it was announced that Kobayashi, Pérez and Gutiérrez would all remain in the Sauber setup for the 2012 season. Sauber started the 2012 season with a double points-scoring finish – Kobayashi sixth and Pérez eighth – in Australia, before Pérez finished second the following week, at the Malaysian Grand Prix; the team's best result as an independent team. Kobayashi then started third at the Chinese Grand Prix behind the two Mercedes cars of Nico Rosberg and Michael Schumacher; although Kobayashi finished the race in tenth position, he recorded the fastest lap of the race, his first in Formula One. Prior to the Spanish Grand Prix, Sauber announced a sponsorship deal with English Premier League team Chelsea. After the race, in which Kobayashi equalled his career-best result of fifth, Peter Sauber announced that he had transferred ownership of a third of the team to CEO Monisha Kaltenborn. Pérez achieved his second podium of the season at the Canadian Grand Prix with third place, while Kobayashi added a ninth place to help Sauber move up to sixth place in the Constructors' Championship. For the German Grand Prix, Sauber achieved their best result of the season. After starting in twelfth position, Kobayashi finished fifth, equalling his best result at the time, before a time penalty for Sebastian Vettel pushed him up into fourth, giving him the best result of his career. Meanwhile, after starting down in 17th due to a penalty, Pérez managed to work a great tyre strategy and finished just behind Kobayashi – prior to Vettel's penalty – in sixth position, giving the team a total points haul of 20, their best since splitting with BMW, and giving them a 53-point advantage over Williams for sixth in the Constructors' Championship. At the Belgian Grand Prix, Kobayashi started second and Pérez fourth, the best grid positions in Sauber's history. At the start of the race, Romain Grosjean caused a spectacular crash taking himself, Pérez, championship leader Fernando Alonso and Lewis Hamilton out of the race. Kobayashi's Sauber was also damaged and he finished the race in 13th place. At the Italian Grand Prix, Sauber scored 20 points; Pérez used a one-stop strategy to move from twelfth on the grid to take his third podium of the season with second place, while Kobayashi finished in ninth place. Kobayashi took his first podium finish and the team's fourth of the season at the Japanese Grand Prix; the following week, it was announced that Peter Sauber was stepping back from the daily management of his team, handing the role of team principal to Kaltenborn. On 23 November 2012, it was announced that Nico Hülkenberg, Esteban Gutiérrez and Robin Frijns would make up the team's line-up for the 2013 season; Hülkenberg and Gutiérrez as part of the race team and Frijns as reserve driver. The team's car for the season, the C32, was launched in Hinwil on 2 February 2013. The livery was changed and the car is now grey, similar to the Sauber cars in the early 1990s. Despite a promising eighth place for Hülkenberg at the second round of the season, the Malaysian Grand Prix, it was clear soon that the C32 was far from the competitiveness shown by its predecessor, with Hülkenberg unable to obtain better than a 10th-place finish in subsequent races and rookie Gutiérrez having been unable to score as of the Belgian Grand Prix. Despite this, Hülkenberg caused a shock by putting his car third on the grid for the Italian Grand Prix, outqualifying both Ferraris in the process. On 15 July 2013, Sergey Sirotkin joined Sauber as a development driver as part of a tie-in with Russian investors with a view to promoting him to a race seat as early as 2014. At the Singapore Grand Prix both Hülkenberg and Gutiérrez were in the points, running 6th and 7th respectively due to pitting under the safety car, but as their tyres went away Hülkenberg managed 9th place and Gutiérrez only 12th. Hülkenberg showed some impressive driving in Korea, finishing in 4th place and allowing Sauber to pass Toro Rosso in the standings. The Japanese Grand Prix saw the team's first double points finish of the 2013 season with Hülkenberg 6th after running most of the race in 4th, and Gutiérrez 7th after an impressive battle with Nico Rosberg's Mercedes. Hülkenberg scored again in the last two rounds and Sauber finished 7th in the WCC with 57 points. In February 2014, IndyCar Series driver Simona de Silvestro was signed by Sauber as an "affiliated driver", with the intent of racing in F1 by 2015. However, by the end of 2014, de Silvestro was no longer part of the team. For the 2014 season, Gutiérrez was retained and joined by Adrian Sutil, following Hülkenberg's decision to return to Force India. The team struggled throughout the season, often going out in the first round of qualifying and failing to score a single point for the first time in team history. On 1 November 2014, it was announced that Marcus Ericsson would drive for Sauber in 2015. On 5 November 2014, Felipe Nasr was announced as a Sauber driver to complete the 2015 line-up. Ferrari Driver Academy member Raffaele Marciello acted as reserve driver. The team also underwent a livery change in accordance to their new sponsor Banco do Brasil. The start of the season saw Sauber become involved in legal action commenced by their 2014 reserve driver, Giedo van der Garde. On 5 March 2015, van der Garde received a partial award under international arbitration by the Swiss Chambers' Arbitration Institution, upholding the driver's contract for a race seat in 2015. Sauber breached the contract when the team instead signed Felipe Nasr and Marcus Ericsson as announced in November 2014. Despite the Swiss arbitrator ordering Sauber to "refrain from taking any action the effect of which would be to deprive Mr. van der Garde of his entitlement to participate in the 2015 Formula One season as one of Sauber's two nominated race drivers", further legal action was required to see the award enforced. Just prior to the Australian Grand Prix held on 13 to 15 March 2015, van der Garde applied to an Australian court who ordered, at first instance on 11 March and on 12 March following Sauber's failed appeal, that he be permitted to race in Melbourne. Due to the risk of having its assets seized for not obeying Court orders, Sauber opted to abort participation in Friday morning's first practice session pending an outcome in contempt of court proceedings against Sauber's team principal, Monisha Kaltenborn. Based on media speculation, however, thanks to an intervention by Bernie Ecclestone to avoid further negative publicity on the sport, Ericsson and Nasr were able to take part in Friday afternoon's second practice session. The matter was temporarily resolved on Saturday, 14 March 2015, following an announcement by van der Garde that he would forego racing in Melbourne, with a view to finding a more permanent solution in the future. The Sauber team and its new drivers for 2015, Ericsson and Nasr, were thus able to complete the Saturday qualifying session and point-scoring race on the Sunday. Three days later, on 18 March 2015, van der Garde confirmed that he and Sauber had reached, by mutual consent, a settlement that would see him relinquish, once and for all, his rights to race in Formula One with the team in return for compensation in the amount of US$16 million. The controversy, however, continued due to a statement released by van der Garde revealing further background and indicating that his intention had also been that of promoting the rights of racing drivers, whose contracts are often dishonoured. In response, the Sauber team expressed surprise at van der Garde's post-settlement statement opting to not comment further on the matter. After the resolution of the dispute, Sauber underwent an improvement from the previous year, finishing fifth in the race, their best result all year. They finished the season 8th, ahead of McLaren and Marussia. On 23 July 2015, Sauber confirmed that Ericsson and Nasr would be retained for 2016.
mid 2016 Sale to Longbow Finance S.A.
On 20 July 2016 it was announced that Swiss based investment firm Longbow Finance had bought both Peter Sauber and Monisha Kaltenborn's shares in the company, which made Longbow Finance the sole owner of Sauber. Pascal Picci was announced to take Peter Sauber's role as chairman of the board and president. Monisha Kaltenborn remained as Team principal and CEO of Sauber. The acquisition by Longbow Finance followed a series of speculation about the future of Sauber. The team had been in financial trouble for years before the change of ownership, often being unable to pay salaries to team members on time. During the season, the team only scored points on one occasion; Felipe Nasr's ninth-placed finish in the Brazilian Grand Prix scored two points for the team, who finished tenth in the Constructors' Championship, one point ahead of Manor. On 11 November 2016, Sauber announced Ericsson would remain with the team in 2017. On 16 January 2017, the team announced the signing of Pascal Wehrlein, replacing Nasr. After Wehrlein was injured in a crash at the 2017 Race of Champions, Ferrari third driver Antonio Giovinazzi took his place for the first winter test. Despite Wehrlein being fit to take part in the Australian Grand Prix, he later withdrew after participating in the first two practice sessions, with Giovinazzi replacing him for the rest of the race weekend. Giovinazzi again replaced Wehrlein for the following race in China. Days before the 2017 Azerbaijan Grand Prix, it was confirmed that the first ever female F1 team principal Monisha Kaltenborn would be stepping down from the team. Her role was replaced by former Renault team principal Frédéric Vasseur. Charles Leclerc on Sauber-Ferrari C37 of Alfa Romeo Sauber F1 Team, during the free practice of the 2018 Chinese Grand Prix at the Shanghai International Circuit. In April 2017, it was confirmed Sauber would end their engine deal with Ferrari and begin a new contract with Honda. However, on 27 July 2017 it was announced that Sauber had cancelled their planned partnership with Honda for 2018 onwards for "strategic reasons". The following day Sauber confirmed their new multi-year agreement with Ferrari for up-to-date engines starting in 2018. On 29 November 2017, Sauber announced that they have signed a multi-year technical and commercial partnership contract with Alfa Romeo, therefore the team will be renamed to Alfa Romeo Sauber F1 Team for the 2018 season onwards. On 2 December 2017 it was announced that Charles Leclerc and Marcus Ericsson would be racing for the team in 2018. Tatiana Calderón was promoted to the role of test driver, having been a development driver for the team in 2017. On 8 April 2018, at the Bahrain Grand Prix, Ericsson placed 9th and picked up 2 points for the team using a 1-stop strategy. Two races later Leclerc finished 6th in the Azerbaijan Grand Prix which was the team's highest position since the 2015 Australian Grand Prix. The race that followed in Spain saw Leclerc finish in 10th and score back to back points finishing results. It was the first time Sauber finished in the points in back to back races since 2015. Over the course of the seaon Sauber would finish in the points on 12 occasions and would get both cars in the points twice. Prior to the Belgian Grand Prix, Sauber announced a sponsorship deal with Austrian private jet operator GlobeAir. Sauber finished the season with a respectable 48 points finishing in 8th position on the Constructors Table, following the season's conclusion Ericsson was not retained for the following season and Leclerc departed for Scuderia Ferrari. On 11 September 2018, Sauber announced that Kimi Räikkönen would be returning to drive for the team for the 2019 and 2020 seasons, swapping places with Charles Leclerc who would be moving to Ferrari. On 25 September 2018, Sauber announced that Antonio Giovinazzi would swap roles with Marcus Ericsson and drive alongside Kimi Räikkönen for the 2019 season. Marcus Ericsson will stay with the team as a third driver and a brand ambassador. On 1 February 2019, Sauber announced that it will compete in the 2019 season as "Alfa Romeo Racing" although the ownership and management structure will remain unchanged. Team Sauber Formula 1 C12 Sauber 2175A 3.5 V10 G 29. Sauber Mercedes[N 7] C13 Mercedes 2175B 3.5 V10 G 29. Red Bull Sauber Ford C14 Ford ECA Zetec-R 3.0 V8 G 29. Red Bull Sauber Ford C15 Ford JD Zetec-R 3.0 V10 G 14. Red Bull Sauber Petronas C16 Petronas SPE-01 3.0 V10 G 16. Red Bull Sauber Petronas C17 Petronas SPE-01D 3.0 V10 G 14. Red Bull Sauber Petronas C18 Petronas SPE-03A 3.0 V10 B 11. Red Bull Sauber Petronas C19 Petronas SPE-04A 3.0 V10 B 16. Red Bull Sauber Petronas C20 Petronas 01A 3.0 V10 B 16. Sauber Petronas C21 Petronas 02A 3.0 V10 B 7. Sauber Petronas C22 Petronas 03A 3.0 V10 B 9. Sauber Petronas C23 Petronas 04A 3.0 V10 B 11. Sauber Petronas C24 Petronas 05A 3.0 V10 M 11. BMW Sauber F1 Team F1.06 BMW P86/6 2.4 V8 M 16. BMW Sauber F1 Team F1.07 BMW P86/7 2.4 V8 B 9. BMW Sauber F1 Team F1.08 BMW P86/8 2.4 V8 B 3. BMW Sauber F1 Team F1.09 BMW P86/9 2.4 V8 B 5. BMW Sauber F1 Team[N 8] C29 Ferrari 056 2.4 V8 B 22. Sauber F1 Team C30 Ferrari 056 2.4 V8 P 16. Sauber F1 Team C31 Ferrari 056 2.4 V8 P 14. Sauber F1 Team C32 Ferrari 056 2.4 V8 P 11. Sauber F1 Team C33 Ferrari 059/3 1.6 V6 t P 21. Sauber F1 Team C34 Ferrari 060 1.6 V6 t P 9. Sauber F1 Team C35 Ferrari 061 1.6 V6 t P 9. Sauber F1 Team C36 Ferrari 061 1.6 V6 t P 9. Alfa Romeo Sauber F1 Team C37 Ferrari 063 1.6 V6 t P 9. ^ The total tally includes 70 races in which the team competed as BMW Sauber. ^ The team won its only race as BMW Sauber. ^ The team achieved its only pole position as BMW Sauber. ^ The total tally includes 17 podiums achieved as BMW Sauber. ^ The total tally includes points achieved as BMW Sauber. ^ The total tally includes 2 fastest laps achieved as BMW Sauber. ^ Sauber dropped Broker as title sponsor mid-season. ^ BMW remained in the team's official title due to issues with the Concorde Agreement. ^ "FIA Formula One World Championship – Entry List". fia.com. Fédération Internationale de l'Automobile. 3 March 2010. Archived from the original on 16 March 2010. Retrieved 3 March 2010. ^ Noble, Jonathan (16 March 2010). "Sauber poised to request name change". autosport.com. Haymarket Publications. Retrieved 17 March 2010. ^ a b Elizalde, Pablo (16 May 2012). "Peter Sauber transfers third of Group Sauber stake to CEO Monisha Kaltenborn". autosport.com. Haymarket Publications. Retrieved 16 May 2012. ^ a b Noble, Jonathan (20 July 2016). "Sauber F1 team announces change of ownership". Motorsport.com. Motorsport Network. Retrieved 31 August 2016. ^ "Sponsors: Red Bull". grandprix.com. Inside F1. Retrieved 31 January 2010. ^ "PETRONAS to be Premium Partner of BMW Sauber F1". www.f1network.com. 27 November 2005. ^ "BMW nets Intel sponsorship". BBC Sport. BBC. 15 December 2005. Retrieved 14 April 2008. ^ "Villeneuve sets Magny Cours pace". BBC Sport. BBC. 15 July 2006. Retrieved 14 April 2008. ^ "BMW ordered to remove nose fins". BBC Sport. BBC. 25 July 2006. Retrieved 15 April 2008. ^ 2006 Hungarian Grand Prix f1.warnerleach.co.uk Retrieved 2 February 2007. ^ "It's the end of the road for Villeneuve". The Times. UK: News Corporation. 7 August 2006. Retrieved 15 April 2008. ^ "Glock signed as BMW second driver". Grandprix.com. 21 December 2006. Retrieved 21 December 2006. ^ "The new BMW F1.07". Grandprix.com. 16 January 2007. Retrieved 16 January 2007. ^ "Interview with BMW Sauber's Mario Theissen". formula1.com. Formula One Administration. 20 April 2007. Archived from the original on 24 February 2008. Retrieved 3 October 2010. ^ "Kubica escapes injury after crash". BBC Sport. BBC. 10 June 2007. Retrieved 10 June 2007. ^ "Heidfeld and Kubica stay at BMW". BBC News. 21 August 2007. Retrieved 21 August 2007. ^ "BMW Sauber gets 'Fit for Pole'". f1technical.net. Retrieved 31 January 2015. ^ "Kubica and Heidfeld stay with BMW". BBC Sport. BBC. 6 October 2008. Retrieved 1 October 2010. ^ Noble, Jonathan (29 July 2009). "BMW will quit F1 at the end of 2009". autosport.com. Haymarket. Retrieved 29 July 2009. ^ Perillo, Simone (29 July 2009). "Statement by FOTA Secretary General". teamsassociation.org. Formula One Teams Association. Archived from the original on 20 March 2012. Retrieved 29 July 2009. ^ "BMW F1 team secures Swiss buyer". BBC Sport. BBC. 15 September 2009. Retrieved 1 October 2010. ^ Noble, Jonathan. "BMW expects team to race in 2010". autosport.com. Haymarket Publications. ^ Pablo Elizalde (27 November 2009). "BMW sells F1 team back to Peter Sauber". autosport.com. Haymarket Publications. Retrieved 28 November 2009. ^ "Sauber will replace Toyota on 2010 F1 grid". BBC Sport. BBC. 3 December 2009. Retrieved 15 December 2009. ^ "Exclusive Peter Sauber Q&A: Ferrari-powered C29 on schedule". formula1.com. Formula One Administration. 30 November 2009. Archived from the original on 3 December 2009. Retrieved 15 December 2009. ^ "Sauber expecting the green light from the FIA". F1 Insight. Blogspot. Retrieved 1 October 2010. ^ "Sauber keeps BMW in official name for now". motorsport.com. GMM. 3 January 2010. Retrieved 1 October 2010. ^ "Sauber confirm de la Rosa for 2010". Sporting Life. 365 Media Group Ltd. 19 January 2010. Archived from the original on 4 June 2011. Retrieved 1 October 2010. ^ Noble, Jonathan (7 May 2010). "Burger King sponsors Sauber team". autosport.com. Haymarket Publications. Retrieved 7 May 2010. ^ "Sauber: It was right to rescue team". crash.net. Crash Media Group. 13 April 2010. Retrieved 15 April 2010. ^ Elizalde, Pablo (3 December 2010). "Sauber announces 2011 car launch date". autosport.com. Haymarket Publications. Retrieved 3 December 2010. ^ Benson, Andrew (10 June 2011). "Sergio Perez to miss rest of Canadian Grand Prix". BBC Sport. British Broadcasting Corporation. Retrieved 10 June 2011. ^ "Alonso Wins in Rainy Malaysia, Petrov 16th". RIA Novosti. Russian News and Information Agency. 25 March 2012. Retrieved 10 May 2012. Perez recorded his best-ever F1 finish and Sauber's best as an independent constructor, but could have won when he homed in on Alonso, only to run wide and lose time six laps from the finish. ^ Cary, Tom (30 April 2012). "Chelsea join forces with Sauber F1 to increase global reach of the London club". The Daily Telegraph. Telegraph Media Group. Retrieved 10 May 2012. ^ "Canadian GP: Race". Sauber F1 Team. Sauber F1. 11 June 2012. Archived from the original on 22 June 2012. Retrieved 11 June 2012. ^ "Vettel receives time penalty, demoted to fifth". Formula1.com. Formula One Administration. 22 July 2012. Archived from the original on 24 July 2012. Retrieved 25 July 2012. ^ "Hamilton supreme at Monza, as Perez shines again". Formula1.com. Formula One Administration. 9 September 2012. Archived from the original on 11 September 2012. Retrieved 9 September 2012. ^ Noble, Jonathan (11 October 2012). "Monisha Kaltenborn becomes new Sauber F1 team principal". autosport.com. Haymarket Publications. Retrieved 11 October 2012. ^ "February launch for new Sauber". Formula1.com. Formula One Administration. 3 January 2013. Archived from the original on 6 January 2013. Retrieved 4 January 2013. ^ "Swiss launch for new-look Sauber C32". Formula1.com. Formula One Administration. 2 February 2013. Archived from the original on 4 February 2013. Retrieved 2 February 2013. ^ Beer, Matt (7 September 2013). "Vettel leads all-Red Bull front row at Monza". Autosport. Haymarket Publications. Retrieved 7 September 2013. ^ Allen, Peter (15 July 2013). "Sirotkin joins Sauber as part of Russian rescue deal". PaddockScout.com. Retrieved 15 July 2013. ^ "Sauber Names Simona De Silvestro Affiliated Driver". ABC News. 14 February 2014. Archived from the original on 24 February 2014. Retrieved 14 February 2014. ^ Pruett, Marshall (20 November 2014). "De Silvestro focused on America, searching for opportunities". Racer. Haymarket Publications. Retrieved 22 November 2014. ^ "Sauber sign Marcus Ericsson for 2015 season". BBC Sport. 1 November 2014. Retrieved 1 November 2014. ^ "Felipe Nasr to drive for Sauber in 2015". BBC Sport. BBC. 6 November 2014. Retrieved 22 November 2014. ^ "Sauber unveil newly liveried C34". Formula1.com. Formula One Administration. 30 January 2015. Retrieved 30 January 2015. ^ Baldwin, Alan (30 January 2015). "New-look Sauber focus on the future after dismal 2014". The Globe and Mail. Phillip Crawley; The Globe and Mail Inc. Reuters. Archived from the original on 1 February 2015. Retrieved 30 January 2015. ^ "Van der Garde begins legal hearing against Sauber". Crash.net. Crash Media Group. 5 March 2015. Retrieved 11 March 2015. ^ a b "Client Update: The driver, the racing team, the Grand Prix and the court – high-speed arbitration enforcement in the Victorian Supreme Court". Allens. 16 March 2015. Retrieved 20 March 2015. ^ "Extensions of contracts with Marcus Ericsson and Felipe Nasr". Sauber F1 Team. 23 July 2015. Retrieved 18 January 2017. ^ Kalinauckas, Alex (20 July 2016). "Analysis: Kaltenborn Remains at the Helm as Sauber Secures F1 Future with New Backers". James Allen on F1. James Allen. Retrieved 31 August 2016. ^ "2016 Constructors Standings". Formula1.com. Formula One World Championship Limited. Retrieved 18 January 2017. ^ "Ericsson to stay at Sauber for 2017". Formula1.com. Formula One World Championship Ltd. 21 November 2016. Archived from the original on 21 November 2016. ^ "Wehrlein joins Sauber for 2017 season". Formula1.com. Formula One World Championship Ltd. 16 January 2017. Retrieved 16 January 2017. ^ "Giovinazzi to test for Sauber in place of Wehrlein". Formula1.com. Formula One World Championship Ltd. 24 February 2017. Retrieved 24 February 2017. ^ "Preview – 2017 Formula One Heineken Chinese Grand Prix & Gulf Air Bahrain Grand Prix". Sauber F1 Team. 3 April 2017. Retrieved 6 April 2017. ^ "Honda confirms Sauber F1 engine deal for 2018". 30 April 2017. Retrieved 30 April 2017. ^ "Sauber cancels planned Honda partnership". GPUpdate.net. Retrieved 27 July 2017. ^ "Sauber confirms new Ferrari engine deal". ESPN.com. Retrieved 28 July 2017. ^ "Alfa Romeo to return to F1 with Sauber". Formula1.com. Formula One World Championship Limited. 29 November 2017. Retrieved 29 November 2017. ^ "Tatiana Calderón becomes Test Driver of the Alfa Romeo Sauber F1 Team". Sauber F1 Team. 6 March 2018. Retrieved 6 March 2018. ^ "Alfa Romeo Sauber F1 Team". www.sauberf1team.com. Retrieved 23 August 2018. ^ "Kimi Raikkonen to return to Sauber on two-year deal". www.sauberf1team.com. Retrieved 23 August 2018. ^ "F1 2019: Antonio Giovinazzi to partner Kimi Raikkonen at Sauber". Sky Sports. Retrieved 26 September 2018. ^ Collantine, Keith. "Alfa Romeo Sauber F1 Team becomes Alfa Romeo Racing". RaceFans. Retrieved 1 February 2019. ^ "Sauber establish junior team with Charouz Racing System". 15 November 2018. Retrieved 19 February 2019. ^ a b Mitchell, Scott (29 March 2019). "Sauber launches kart team with ex-Rosberg/Hamilton boss". Autosport. Motorsport Network. Retrieved 30 March 2019. ^ Benyon, Jack (19 February 2019). "Sauber Junior Team reveals 2019 line-up". Motorsport.com. Motorsport Network. Retrieved 19 February 2019. ^ Kalinauckas, Alex (9 April 2019). "Arthur Leclerc joins Sauber junior team". Motorsport.com. Motorsport Network. Retrieved 9 April 2019. ^ Wood, Elliot (15 April 2019). "Stuart White receives Sauber support for French F4 return". FormulaScout. Retrieved 15 April 2019. Wikimedia Commons has media related to Sauber.